A Monday morning wreck lead to the closing of highway 105 in Boone for a short time Monday morning. 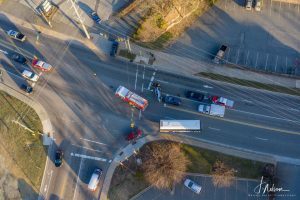 The wreck, at the intersection of 105 and Wilson Drive, occurred at 8:05 am and involved two vehicles, according to a report by Boone Police. A 2001 Ford, driven by Savannah Parker of Roan Mountain Tennessee, was traveling north on Highway 105 when she struck a 2011 Toyota, driven by Jyssica Lockwood of Vilas. Lockwood was making a left turn onto 105 from Wilson Drive when Parker failed to stop for the traffic light, according to the report. Parker was transported to Watauga Medical Center, treated and released. She was cited for a red light violation. That portion of 105 was closed for approximately 15-30 minutes.